Welcome to a new week! The purpose of this blog is to help you write stellar business proposals, to help you sell and run your business, and to give you updates on the software and business. Well, if you didn’t happen to read TheNextWeb last Thursday, we have some Big News!! TheNextWeb announced our successful seed funding round of $655,000, with a rockstar team of investors. We’ve also set up our HQ in San Francisco, a short walk from the beach, while we still have an office in Minsk, as well as off-shoots in New York and Barcelona. And we can’t wait for you to see some of the big and small software updates, including forthcoming full-site translations into Spanish and Dutch, that will be popping up over the next month or two. We’re all spending that money to give you what you’ve been asking for. In summer 2011, I was on vacation, and Serge [Barysiuk] had to create sales proposals for our first joint venture — Coding Staff. Coding Staff specialized in building small products for larger CMS systems and providing services around them. Being an engineer and geek, Serge hated writing sales proposals every day and thought there should be a better way to handle this process. After six months and dozens of proposals, we decided to build a complete system to solve our own dilemma and quickly realized the market potential. In November 2011, we launched Quote Roller, Inc. and have since been focused on making Quote Roller the best cloud application to create, send, and process sales proposals. The techie pair wanted to spend more time working on techie things and expanding their own SMB and to spend less time on proposal writing. Of course, thinking faxed and text doc proposals “were so 1995,” they also wanted their proposals to be beautiful and online. They decided to launch a website and app that allows for customizable templates that can include photos, videos and other samples of work, with an e-signature that better assures the sale. Bonus, they made one that they could see exactly what their clients were looking at so they could anticipate objections and be ready to respond. For those of you that have been with Quote Roller for awhile now, you know that we’re always looking to update and improve the product, based on your feedback — so keep it coming! And since we know there’s so much else to do in your day-to-day sales and client management, we are always looking for new partners to integrate with our service, which includes about 15 already. Beyond the site and service, we’ve been expanding behind the scenes, too. The end of last year, Serge and Mikita looked to take our Europe-based company to the States. Serial entrepreneur and investor, San Fran-based David Currie came on board as an advisor in November, and then as our CEO this January. He has contributed greatly to our fundraising and business development, and is providing key guidance to help us “build-it-right from the start” in all areas. Then, Ragnar Sass, the founder of one of our integrators PipedriveCRM, joined as an adviser. He introduced the Quote Roller board to Jeremie Berrebi of Kima Ventures, who became our lead investor and who brought with him even more investors. David also brought on some of his U.S. contacts, like Eric Dunn of Intuit. As Mikita says, “We were fortunate to be able to focus on investors who brought knowledge and expertise, and who could help with marketing and connections.” These awesome investors also included Fotolia’s founder Oleg Tscheltzoff and Google’s Ihar Mahaniok. Our first seed round goal was to raise $500k, but in less than a month, we actually went well over that, feeding more growth faster. The money’s being spent on expanding and improving the product, ramping up our marketing, and moving to a bigger U.S. base. The new San Fran HQ opened on the first of the year, and right now we’re settling into an even bigger office to accomodate our growing staff in a very West Coast way. 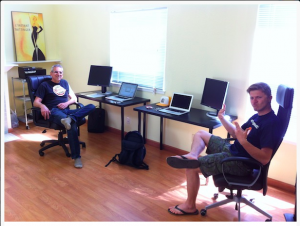 Ala Mark Zuckerburg and other SilVal start-ups, Quote Roller’s newest HQ is a near-enough-to-the-beach home-slash-office. 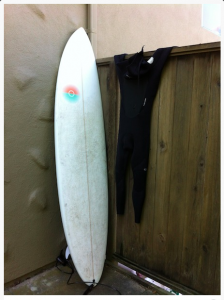 (Mikita’s already brought out his wet suit and surfboard.) Yes, the West Coast team will eat, sleep and breathe making your business proposals more convincing and efficient. I remember those days when we decided to start the project. It was just “OK, we need to do something cool on our own.” We were so naive at that time, but we’ve learned a lot and overcame small and big troubles — you could find us sitting with laptops and fixing our failed server at the pub in the middle of a party, figuring how to do one or another feature, waking up late night to catch up with a client on a different continent. Now, it’s all worth it because people like and need what we’re doing. So what’s the next step for Quote Roller? Well, we might have a few more tricks up our sleeves, but we want to hear from you! How do you envision the Quote Roller of the future?